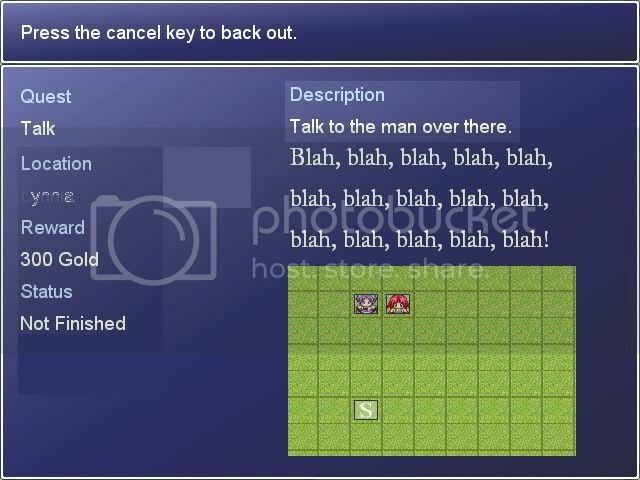 A script that keeps track of quests you obtain and complete. # the quests, false it wont. 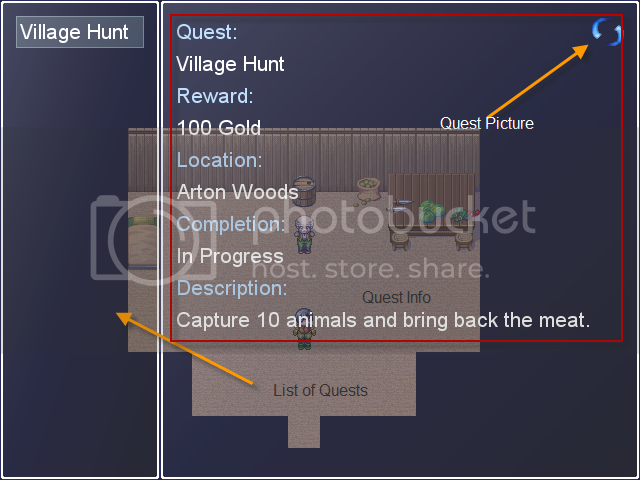 when 1 then return "100 Gold"
when 1 then return "ghost"
when 1 then return "Village Hunt"
when 1 then return "Arton Woods"
when 1 then return "Capture 10 animals and bring back the meat." If you use RMX-OS and you would like to use this script with it. Place the above script below RMX-OS. Then place the plugin below beneath the above script. Looking for a fast way to configure this? Check out mroedesigns' config tool! Very nice and simple script, i suggest using it for its simplicity. thanks sally I decided to make my own quest log when I couldnt find one with a right layout and/or making a quest easily. Those would make it perfect. But those are just suggestions. It works good, serves its purpose. Go with Yin's suggestion, thats all I can say. as long as you dont have a custom save system above it you can place it anywhere. Do i add the snipplet as it´s own, or do i put inside another script? You approx. know what the STCMS looks like, so i just want to add a manu for the quest created with your quest script. Well if you're using this with STCMS just place it above it. It can be under neath it and still work but the scripts need to be in order according to blizz's. Awesomeness Will this work with RMX-OS? The saving will need to be a bit altered is all. So it saves quests. I'll make an rmx-os add on when a later version of rmx-os comes out. If you want it now I'll make one. I´ve got working now. Thanks to Jackolas. You'll have to define another save variable in RMX-OS for this to work properly. It's quite simple, and very effective.